The photo below seems to have been made in a metal storage shed and provides some idea of the size of the ram whose front legs are missing. 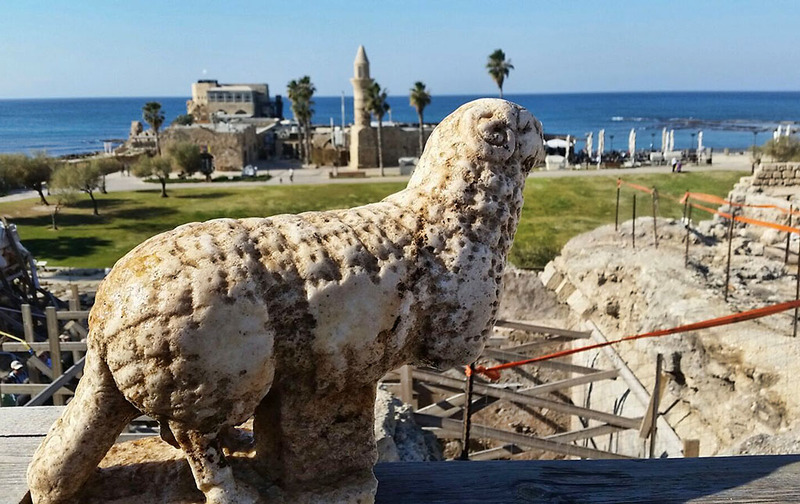 Ram discovered at Caesarea. Photo: Vered Sarig, The Caesarea Development Corp. In the next photo the ram looks much larger than it is because of the relationship to the camera. The aerial photo below will help you put the discovery location in perspective. It shows the area of the Byzantine church that was built on the site about A.D. 525. Kenneth Holum of the University of Maryland announced in 1995 the discovery of Herod the Great’s enormous temple dedicated to the Roman Emperor Augustus underneath the ruins of the Byzantine church. 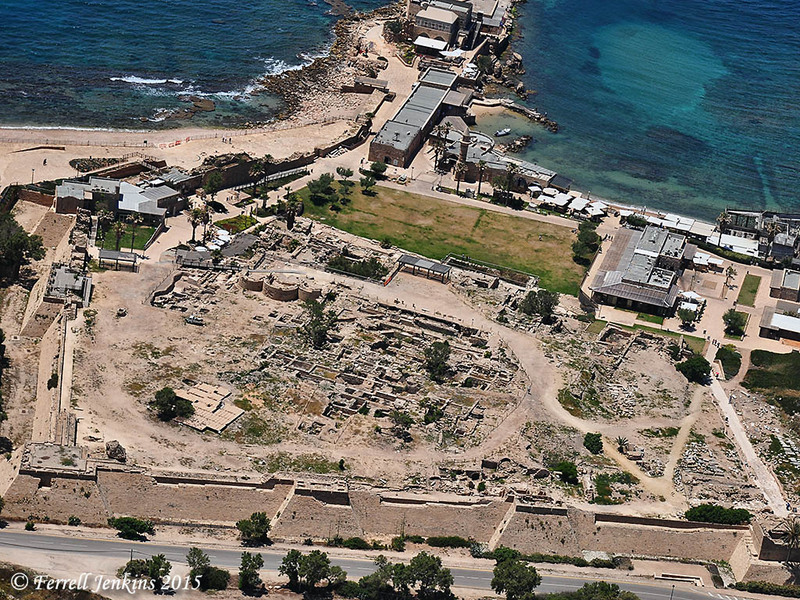 Aerial view of Caesarea Maritima showing the area of the Byzantine church ruins. The view also shows the Crusader wall. Photo by Ferrell Jenkins. When the Pharisees and scribes complained that Jesus received sinners and ate with them, He told them a parable that we call the parable of the lost sheep (Luke 15:1-7). “When he has found it, he lays it on his shoulder, rejoicing.” This describes the work of good shepherds and a practice that was well known to those who heard Jesus. On another occasion Jesus called Himself the good shepherd (John 10:11, 14). The motif of the good shepherd with the sheep on his shoulder became common in later Christian iconography. 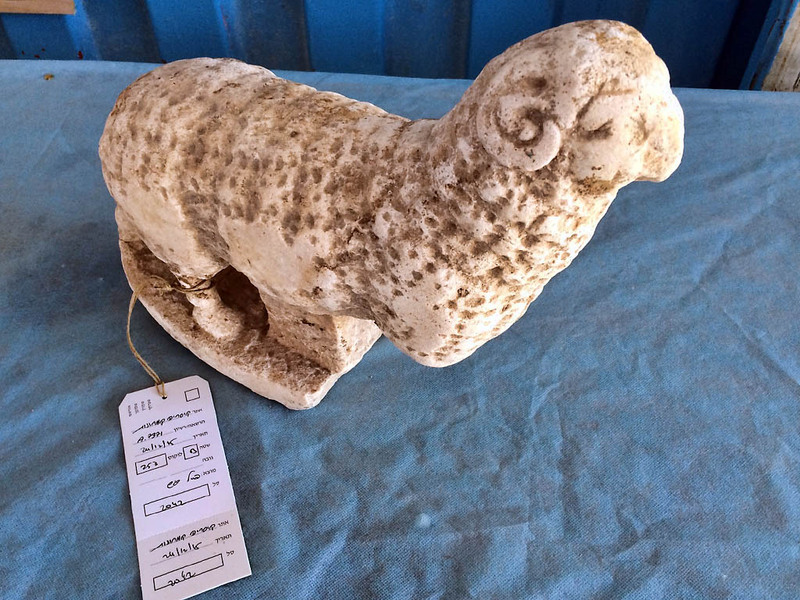 For some examples of Good Shepherd statues/statuettes from the Byzantine period see our post here. 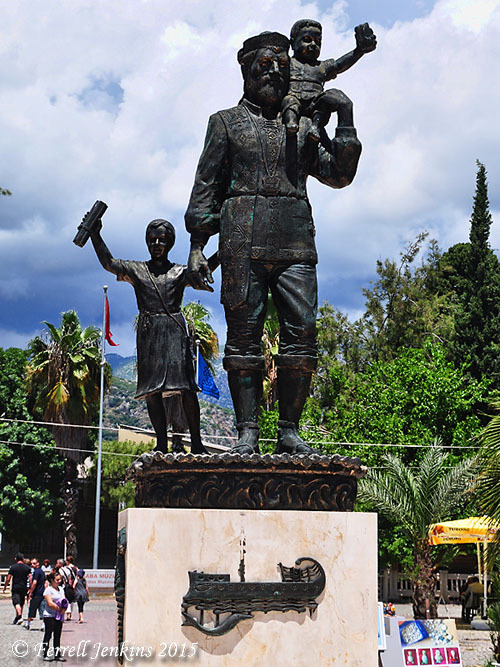 You have read on this blog and other places about the Saint Nicholas of Myra, a town on the southern Mediterranean coast of Turkey. Recently I learned of the video featuring Dr. Mark Wilson and Dr. Adam English now available free for those who have access to Amazon Prime. The 55-minute video is high quality. The video provides information about the priest by the name of Nicholas and his work in and around Myra. As Bishop of Myra, Nicholas defended the doctrine of the trinity at the Council of Nicea (Nicaea) in A.D. 325. There is a strong claim that he is buried in Bari, Italy. I think you might enjoy the film and learn something about Church History in the process. If you have Amazon Prime you can search for Saint Nicholas: the Real Story, or use this link: Saint Nicholas: the Real Story. The town of Myra is known to students of the New Testament as a place where the apostle Paul transferred ships while he was being taken to Rome for trial before Caesar (Acts 27:5). My most recent post about the city is available here. Bethlehem and the Birth of Jesus. Our total number of posts has now grown to more than 1800 and this makes it difficult to locate a post you may need. This index is prepared to assist you in your study of the birth of Jesus in ancient Bethlehem. Most, if not all, of the posts include at least one photo illustrating the lesson. Bethlehem and the birth of Jesus. 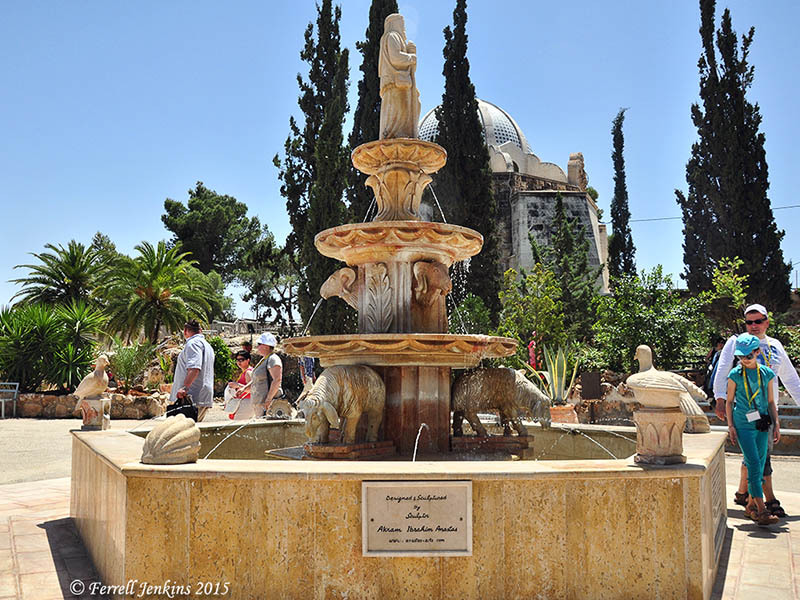 Bethlehem – the Birthplace of Jesus. Bethlehem – home of David and Jesus. Visiting the Shepherd’s Fields near Bethlehem. Includes photos of the Catholic, Greek, and Protestant sites. Fountain at Franciscan Custody Shepherd’s Field near Bethlehem. Jerome in Bethlehem. Jerome lived in Bethlehem for nearly 40 years. He translated ancient Hebrew and Greek manuscripts of the Bible into what we call the Latin Vulgate. Bethlehem and Shrines. Discussion of the origin and value of shrines related to the birth of Jesus. Was Jesus Born in Winter? Previous posts relating to the birth of Jesus and Christmas. What About Christmas? A brief article discussing the history of Christmas. 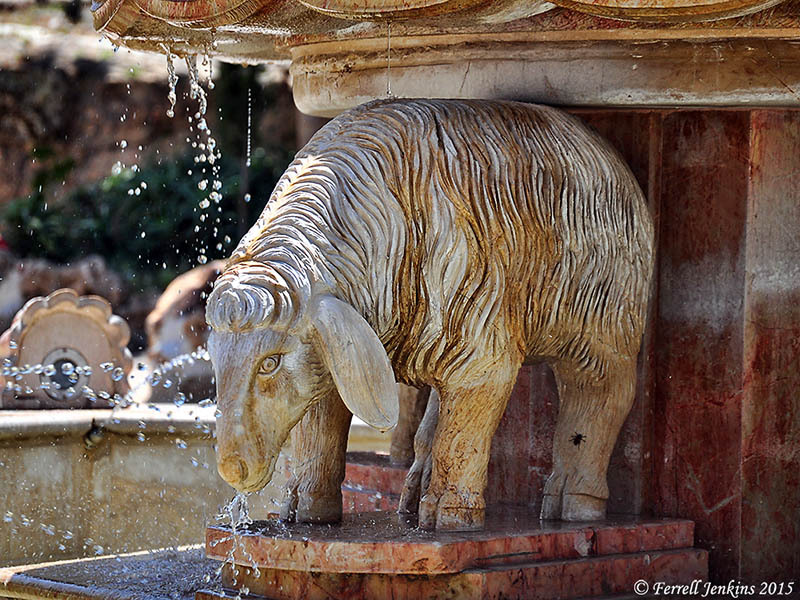 Sheep at fountain of Franciscan custody Shepherd’s Field near Bethlehem. Other places near Bethlehem. Most of the links below are related to Herod the Great and the fortress he built near Bethlehem. I see that I have normally used the spelling Herodium, but sometime Herodion. The Pools of Solomon. These pools, south of Bethlehem, supplied water to Jerusalem in New Testament times. Herodium and the tomb of Herod the Great. Psychological Study of Herod the Great. View east from the Herodium. Prof. Ehud Netzer critically injured at Herodium. Archaeologist Netzer dies after fall. Royal theater box at the Herodium. The Herodium, Tekoah and Ashkelon. Herod the Great in the Israel Museum. A morning with Shmuel Browns. Includes a visit to the Herodion. Herod the Great in the news. This post includes an aerial photo. Should Herod’s Tomb be Rebuilt? Historical Connections to Modern Christmas Celebrations. These post are post-biblical, historical references to customs associated with Christmas. Myra, home of Saint Nicholas. Myra, in present-day Turkey, is the home of a Greek Orthodox bishop known as Nicholas. Several legends arose around Nicholas who was noted for giving gifts to the poor and raising the dead. Christmas, St. Nicholas, and Myra. When other posts on this subject are written I will try to remember to update the list. David E. Graves sent me two of his recent books. The first to mention is Biblical Archaeology: An Introduction with Recent Discoveries that Support the Reliability of the Bible . 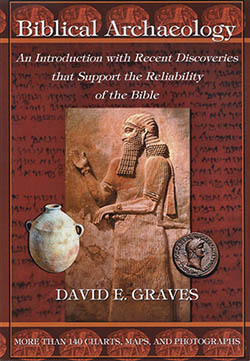 I like the subtitle: An Introduction with Recent Discoveries that Support the Reliability of the Bible. This is a large paperback of 375 pages, published in 2014. Biblical Archaeology includes more than 140 charts, maps and photographs (all in black and white), a glossary, extensive bibliography and index. Dr. Graves holds a Ph.D. from the University of Aberdeen, has been involved in teaching the Bible and archaeology for more than 30 years. He has participated in archaeological digs for several years. This book will not please the person who wants a slick paper, large print book filled with color photos. It will be extremely helpful to the person who would like to have a thorough survey of Biblical Archaeology. This book covers so comprehensive that one is bound to disagree with a point here and there. Points that I observed gave me opportunity to think and expand my thinking. The book is available in Kindle format for about half the price. Graves also has a similar book dealing with the Old Testament themes. David maintains Deus Artefacta, a blog about issues like those discussed in these books. I provided five photos for this book, and two for the book on archaeology. Recently I received two packages of books from Shay Hausman, president & CEO of Carta Jerusalem. Each package included two books I needed or wanted. Far back I have called attention to some of the excellent Carta publications. I will make a list to those posts at the bottom of this one. R. Steven Notley wrote the New Testament portion of The Sacred Bridge, an excellent book too comprehensive and expensive for the average non-trained Bible student. The material was published in an abridged edition without all of the scholarly notes in a work entitled Carta’s New Century Handbook and Atlas of the Bible. Now Carta has published some of the New Testament material is a new format. 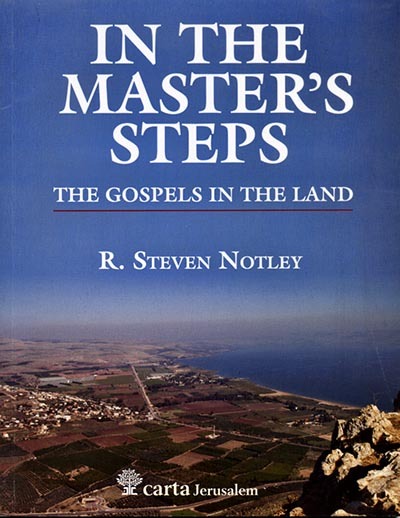 This book by R. Steven Notley is entitled In the Master’s Steps: The Gospels in the Land (The Carta New Testament Atlas) . The book of 9 chapters plus preface and index covers the ministry of Jesus from His Birth to the Resurrection and Ascension. It has lavish drawings, photos, and maps to assist the Bible student. And it has print large enough for older readers to enjoy. (Just ask me!) Those who have visited the proposed site of Bethsaida may already know that Notley has taken exception to the identification of the site of et-Tell with the home of Peter, Andrew, and Philip (John 1:44). In this new work you will be able to examine his evidence and draw your own conclusions. I am pleased to recommend this excellent paperback. Notley, In the Master’s Steps: The Gospels in the Land. I saw Prof. Notley browsing the book exhibits at the Society of Biblical Literature meeting in Atlanta a few weeks ago. Having met him at a previous annual meeting I spoke. He pulled a copy of this next book from his briefcase and showed it to me. When I asked if this was mostly the content of the larger atlas he said that they were criticized for not including enough material on Jerusalem. This book, he said, was to remedy that situation. He stated that there are more books to come. 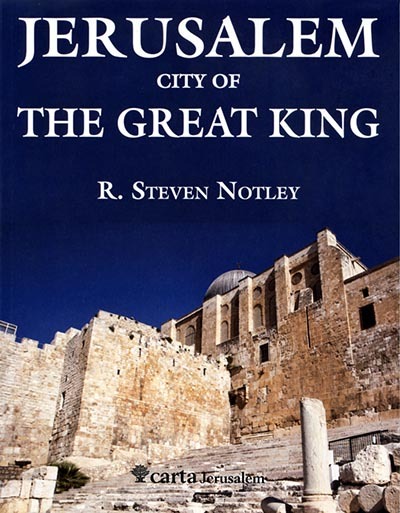 This book is a good one for most anyone studying portions of the Bible with their setting in Jerusalem. It is especially helpful for those studying the ministry of Jesus. The next book is smaller, being only 40 pages. 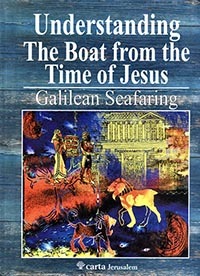 Understanding the Boat from the Time of Jesus: Galilean Seafaring is written by Shelley Wachsmann. Those who have seen the Roman-era boat uncovered from the Sea of Galilee in 1986 will revel in the story told by Wachsmann who directed the excavation of the 2000 year old fishing boat. The story of this discovery, the excavation, and preparation of this boat for display at Nof Ginnosar is a fascinating one. 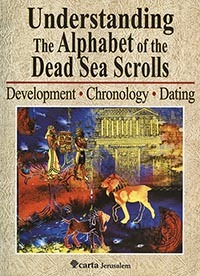 The final of these four books is Understanding the Alphabet of the Dead Sea Scrolls by Ada Yardeni. This is a valuable book for those interested in the Dead Sea Scrolls, the Hebrew Bible, and the Hebrew language. It occurs to me that anyone involved in calligraphy might find the book interesting. The book is filled with illustrations showing how to draw the alphabet of various scrolls and inscriptions. Earlier references to Carta Jerusalem books. The links I have provided go to Amazon. The books are not as easily located in the United States as some other books, but you may be able to locate them elsewhere. 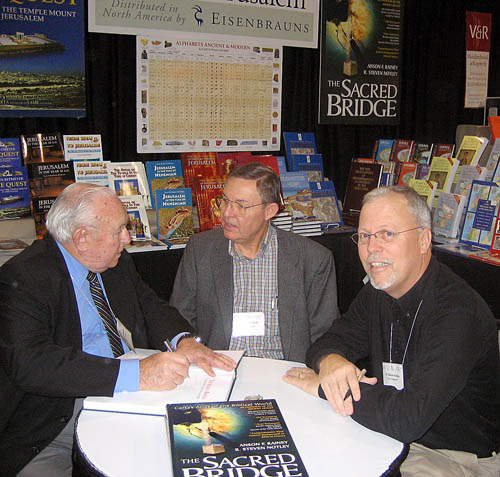 Anson Rainey (1930-2011), Ferrell Jenkins, and R. Steven Notley at SBL in 2006. As mentioned above, these books were sent to me by the publisher. The comments represent my own opinion. Books purchased from Amazon through these links will net me a few cents per book. Nothing I think of as substantial. Happy reading. When you read good books and when you give good books to others, especially those who teach the Bible, you are doing a favor for several persons at one time. During the past six months I have received several good books sent to me by authors or publishers who would like you to know about their publication. Normally I might have gotten to these publications much sooner, but due to two episodes of major disruptions to our home life I have gotten behind. One was the flooding of the house from a water line break resulting in disruption for three months. The other was due to a large fallen Laurel Oak limb that did considerable damage. We had two huge dying trees that had to be taken out. Add to that some family health issues and you will know my excuse for this delay. Rather than writing a long review of each book I will list each with a few comments. 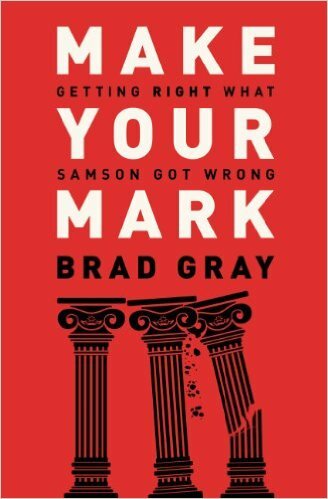 The first book is Brad Gray’s Make Your Mark: Getting Right What Samson Got Wrong . Gray is a teaching pastor in Holland, Michigan, who has lived in Israel and traveled extensively in the Bible lands. I met him in Jerusalem back in May. This paperback of 194 pages deals with the four chapter of Judges (13-16) telling the story of Samson. Everyone who goes to Bible classes and church knows about Samson, but you will get a new understanding and appreciation of the episodes recorded here when you let Brad Gray explain the setting of the events. Brad Gray, Make Your Mark. The author’s acquaintance with the Bible lands, the relevant archaeological discoveries, and his engaging writing will help bring this section of Scripture to life. Samson got a lot of things wrong, but author Gray says you can avoid his mistakes and get these things right in your life. This book is recommended for anyone teaching the book of Judges or anyone grappling with the serious issues of life. Make Your Mark is published by Faith Words, which seems to be a division of Hachette (New York, Boston, Nashville), and is available in print and Kindle format. This book was sent to be by the publisher at the request of the author. The comments here are my own. What is the Feast of Dedication? This feast, observed on the 25th of Kislev (roughly our December), had its origin in the period between the testaments. 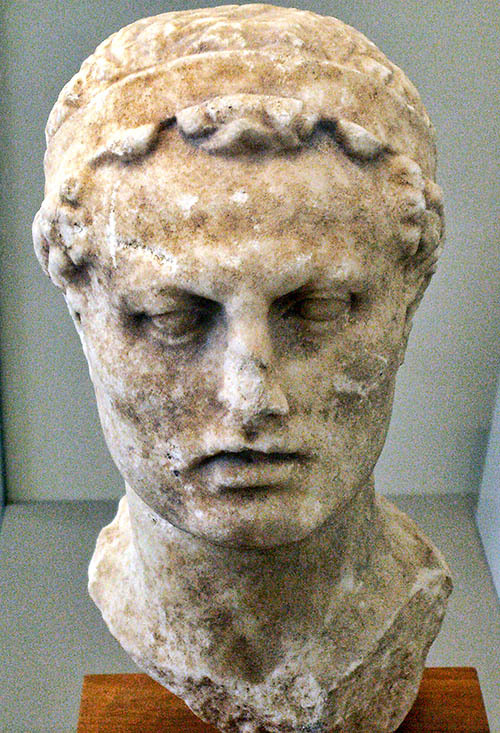 The desecration of the temple by the Seleucid ruler Antiochus Epiphanes took place in 168 B.C. The climax of the Maccabean revolt was the removal of all evidences of pagan worship from the temple. An eight-day feast of dedication was observed in 165 B.C., and continued to be observed annually by the Jews. Archaeologists working with the Israel Antiquities Authority have been searching for the tomb of the Maccabeans at Modin in recent years. See the report here.